My short review was kind of a troll, but actually, the musical movie is better. I really like the story of Les Mis. I was first introduced to the Focus on the Family Radio Theatre version, which is a really good dramatised (my fingers insisted on typing the British spelling) version that abridges it into a really good four hours, plus BRIAN BLESSED DOES JEAN VALJEAN. Les Mis, as a story, has got a lot going for it: love, redemption, forgiveness, GRACE. But wow did Victor Hugo need an editor. The intro of my Kindle version mentioned that Hugo wrote this while he was exiled on an island, so I guess he had ludicrous amounts of time to write??? I opted for the unabridged version because you know, I didn't want to miss any of what the author originally intended, but I DO NOT RECOMMEND that approach to this book. Apparently what the author intended was for everyone to spend hours reading about the history of the guy who remodeled the Paris sewers, or maybe his opinions on slang. While it was impressive that he had so much knowledge and background, it was SO distracting from the actual story. By the time I finished 20 chapters on the Battle of Waterloo, I couldn't remember what was happening in the actual plot. This book took me over two years to complete for goodness sake. Hugo could've written the novel at around 400 pages, and then written a 500 page The World of Les Miserables book with all the incredibly in-depth history. I'm very impressed at how the musical version managed to capture chapters and chapters of material in 2-3 minute songs. So I wouldn't suggest reading this unabridged. If you like Les Mis, my recommendation would be to check out the radio theatre, musical or even the Liam Neeson film or the Gerard Depardieu miniseries. There were few things in the book that added more depth to the story for me, but not enough to make it worth it---I liked getting a little bit of backstory on the Bishop, Fantine's past was even sadder than I thought, Enjolras was even more in love with THE REVOLUTION than in the musical, Marius and Cosette's courtship (and his grandfather planning their wedding) were hilarious, Eponine deserves her own book, and Gavroche was particularly adorable and heartbreaking. 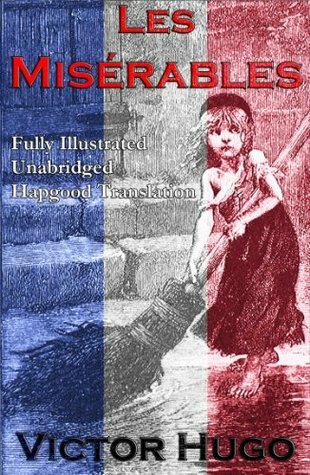 Sign into Goodreads to see if any of your friends have read Les Misérables. 51.0% "I picked this back up today. I'm so entertained my Marius right now. He's all, "I keep seeing this pretty girl with her dad, so I'mma get some new clothes and walk past everyday hoping she'll notice me."" 53.0% "Well Eponine is completely nuts." 54.0% "Yay I made it a whole percent in a day! #suchalongbook"
0.0% "That awkward moment when your neighbor happens to be scamming your crush and her dad and the same neighbor turns out to be the guy tire crush lived with when she was a kid. And he also happens to be the guy who saved your father's life and the cop you go to for help happens to be the guy who's been chasing your crush's dad for years. #coincidences #orarethey?" 57.0% "And now "a few pages" (six chapters) of history...."
60.0% "Yay! 60% feels so much more accomplished than 59. I will get through this book!" 63.0% "Everyone in this romance is hilarious." 65.0% "Wow Marius\n Much Birds\n Very Poetry\n So Love"
67.0% "I am officially past 2/3!!!" 67.0% "Why must Gavroche be so adorable and sweet? I know how this ends!" 76.0% "More than 3/4 of the way! #IThinkICanIThinkICan"
76.0% "Enjolras, who was standing on the crest of the barricade, gun in hand, raised his beautiful, austere face. "...don't disgrace the barricade" ---Enjolras, to everyone probably"
87.0% "out of the barricade and into the sewers ugh"
89.0% "Yes, I've always wondered about the in-depth history of the man who remodeled the Paris sewers in the 1800s, so glad to have 3 chapters on this information that is SUPER RELEVANT TO THE STORY I'M ACTUALLY READING"
90.0% "Welp not quite going to make it through this by the end of Jan....\n \n *sings* ONE WEEK MORE"
93.0% "Marius's grandfather is my new favorite. I want a spinoff where he is a wedding planner b"
94.0% "And you thought a lot of characters die in the musical..."
95.0% "Ditching Cosette after the wedding is such a jerk move, Jean Valjean. I think it's selfish rather than selfless to decide what's best for someone without consulting them." 95.0% "I take it back, Marius is being a worse. LET GIRLS MAKE THEIR OWN DECISIONS"
Stephanie wrote: "You're so brave! So inspiring! ;)"
Haha, you can say that if/when I actually finish. ;) I feel like there's only about 5 chapters of actual plot left, so I'm expecting A LOT more back story tangents. Will post a real review eventually, but trolling for now.